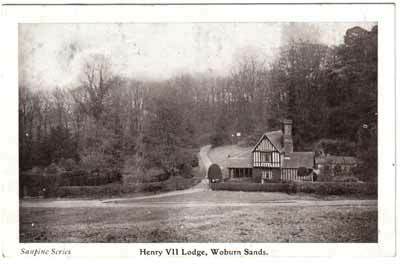 One of the most picturesque buildings in Woburn Sands is the “King Henry VII Lodge” on the road out of Woburn Sands to Woburn. However, it is not as old as the architecture would suggest, and was actually erected in 1810. Aspley Cottage “It has, of late,” says Mr Repton, (from a M.S. Volume, on Improvements Proposed at Woburn Park) in reference to this subject, “become a common practice to erect Cottages, and small houses, in a style called Gothic, for which there is no authority in the ancient remains of the 15th and 16th centuries.” As a contrast of these, and for the sake of preserving a genuine specimen of that kind of architecture which prevailed 1450 to 1550, the Timber Cottage, at the extremity of Aspley Wood, has been erected in the years 1810 and 1811; and by order of his Grace the Duke of Bedford, the strictest attention has been given to the detail, as will appear from the authorities subjoined. 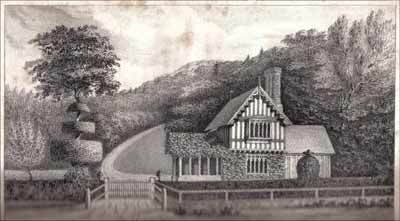 “A Cottage built by the Duchess of Bedford, in the style of Henry VIIth’s Reign. Sept 2, 1816“. This watercolour, by Diana Sperling, was painted when the house was just six years old. It appears in the book “Mrs Hurst Dancing”, by Gordon Mingey. Published by Gollancz in 1981, now a division of The Orion Publishing Group. Their, and my, attempts at tracing the copyright holder were unsuccessful. Few buildings of this early date remained entire; the general plan of this cottage is, therefore, not taken from an individual specimen, but the parts are copied from the most perfect fragments of the kind, some of which have since been destroyed. 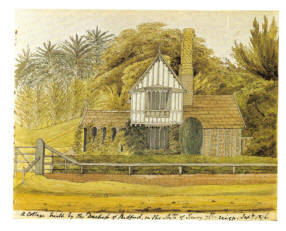 It may, perhaps, be objected, that this cottages too small for a Mansion, and too richly ornamented for the habitation of a labourer; but such was often the style of old Manor Houses, whose dimensions did not exceed those of this building, which is quite as large as the old Farm House at Stone Wall, near Penshurst, in Kent, where an ancestor of the Woodgate family resided, when he served the office of High Sheriff for that county. Specimens of timber houses are every year becoming more rare, not only from the decay of the materials, but from the prevailing rage for what is called improvement, by exchanging old form for new. It is, however, worthy of remark, that the timbers for many of these buildings, which have been exposed to the weather for the past three centuries, appear never to have been painted. Authorities The lower story is at stone. This hint is taken from a building near Eltham Palace, in Kent, except that the windows are here of oak, instead of stone, which was not uncommon, both in buildings of stone and also of brick, as at Wolterton Manor House, and Carhow Priory, in Norfolk. Stone, and even brick corbels, supporting beams, may be seen at Lynn Regis, and at Ely. The brick nogging, between the timbers, is copied from a curious specimen at Lynn Regis, built in the reign of Edward IV. The hint of upright timbers, ornamented with small tracery, over the centre building was taken from a house near Kelvedon, in Essex, very lately destroyed; but a similar building is still remaining in the Market Place of Newark, Nottinghamshire. The gable board is copied from a house at St Edmunds Bury, but is not uncommon. The pinnacles, being the parts most exposed to weather, few specimens in wood are now to be found: the only perfect one though, is at Shrewsbury; but this form is common in brick and stone gables. The vane, or square flag, is copied from one at Hornchurch, in Essex. The projecting bow window is taken from one at Norwich; but the tracery is not uncommon; specimen of it in oak can still remains at Knowl, in Kent. The tracery of for lower window is copied from a Timber House, at Coventry, and is, also, not uncommon, such forms been preferred to those more rare or fanciful. The general outline of all the windows is taken from an earlier date than end the reign of Henry VIII. Before, they were divided by a cross bar, which did not prevail in wood till the reign of Edward VI, Elizabeth and the 17th century. The design for the porch is from various specimens of open porches, and particularly the cloisters of several alms houses, of which a fragment remains at Clapton, near Lea Bridge. The door is after one remaining at Sudbury, in Suffolk and the handle did belong to the Vestry Door of Sall Church, in Norfolk. The ornamented shafts of the chimnies are taken from some of those which are in perfect preservation at Wolterton Manor House, near Bansham, Norfolk, of which very curious building there are now four large plates engraving of the Society of Antiquaries, from drawings by my son, Mr S. A. Repton, F.A.S; to whose spirit of enquiry and knowledge in the style of architecture, the erection of this singular building has been solely committed, and it is hoped will remain a curious record, when time shall have destroyed those specimens from which the original hints have been selected. 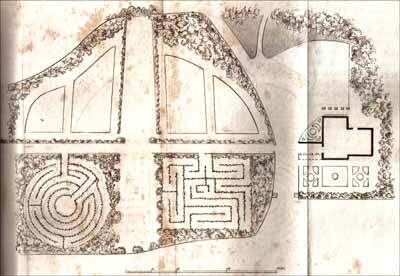 The original plan and garden layout from Forbes book. 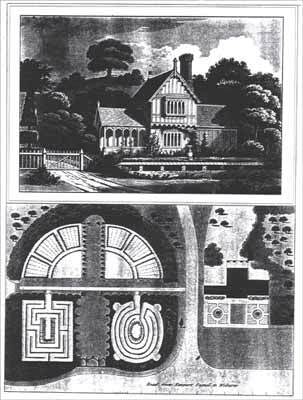 The garden, to accord with the style of the cottage, is proposed to be unlike modern landscape gardening; but as no specimens exist of such gardens, or even a fence by which they were enclosed, the rail in front is copied from one in an old painting of Henry VIII, in the Council Room of the Antiquarian Society; and the clipt hedges, mazes, and parterres, are taken from prints of Hans Holbein, and various pictures of the same date. 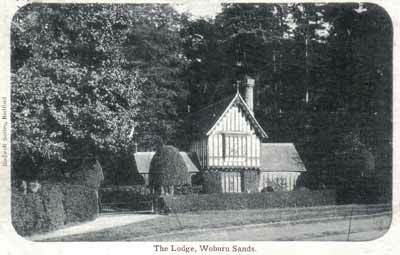 In 1904, almost 100 years after they were laid out, “Gregory’s Guide and View Book of Woburn Sands”, mentions that some remains could still be seen then of the topiary and mazes in the grounds of the house. 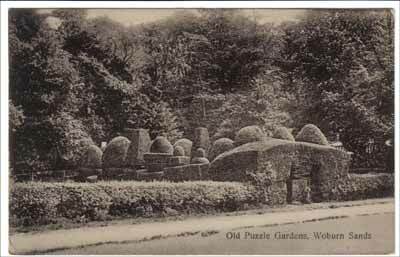 Certainly, the decorative garden works were still visible as late as 1925, as postcards were made showing the “The Old Puzzle Gardens”. I have collected more than 25 different examples of the house in postcards, and a further three of the Puzzle Gardens. They were obviously the first port of call for any photographer when looking for attractive views to sell to the visitors of Woburn Sands!